A little background first. Carrie Stuart Parks is a forensic artist and instructor. Her portraits helps nab bad guys. So I guess when it comes to putting "realistic" in the book title, she's well qualified. The tone in the book is conversational and fun. "It's not how well you draw; it's how cool your drawing stuff is," she says about the first rule of art. Alright, I'm not too sure about that rule. Speaking of drawing tools, this book teaches portrait drawing using pencils, so it's a black and white portrait drawing book. The tips and techniques she shares are concise and easy to follow. It's a very practical book and you should see improvements quickly while following along. I must admit that I still can't draw perfectly realistic faces, but that's because I don't practice as much. The good thing is after reading this book, at least I know my problematic areas, and can concentrate on fixing them. So it's just a matter of practice and following through. It's an effective book recommended to all levels of artists. 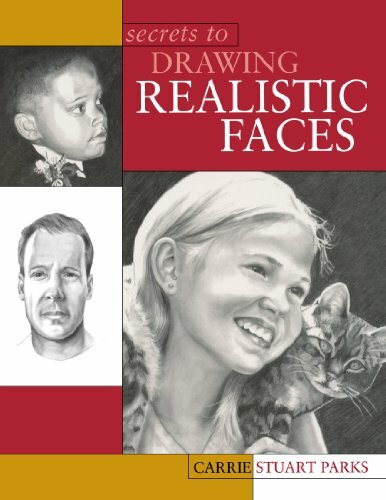 This book is the end result of years of training police officers to draw correct composite faces. I had been using other drawing books and found there were errors in the materials--incorrect proportions of the nose, pupil not centered in the iris, too large an iris and so forth. I also needed a way to teach the face in an extremely short amount of time. Dr. Betty Edwards introduced seven drawing tools to help you see and draw better. I uncovered about 27 tools to help you as an artist. I hope you enjoy and learn from its pages and it will help you grow as an artist. She conducts lessons as well and you can find information at stuartparks.com.